North Star Air is operating a two-engine turboprop ATR 42-300 aircraft for a two-month trial period on a Flex Flight route from Eabametoong, Neskantaga and Webequie to Thunder Bay. The aircraft is leased from West Wind Air in Saskatchewan. Photo by Rick Garrick. Roy Moonias, from Neskantaga, says it was an “awesome” flight on the ATR 42-300, which is being leased from West Wind Air, a First Nations and employee-owned airline based in Saskatchewan. North Star Air added the ATR 42-300 to its fleet as part of the company’s overall investment strategy to serve new routes and support the growing needs of communities and customers. In addition to the Flex Flight route to Eabametoong, Neskantaga and Webequie, the ATR 42-300 is also be available for charter flights. North Star Air currently has revenue share agreements with 11 First Nation community partners, who collaborate with North Star Air to address their air transportation requirements on a regular basis. 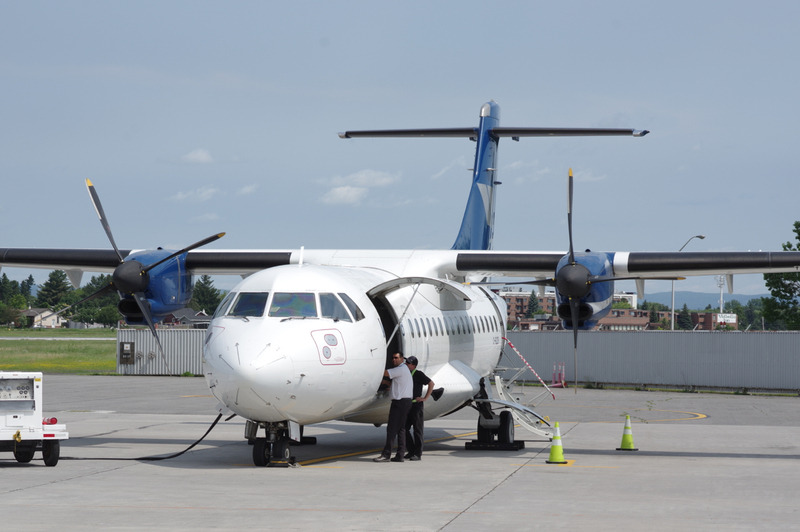 North Star Air plans to operate the ATR 42-300 on the Flex Flight route to Eabametoong, Neskantaga and Webequie for a two-month trial period, beginning with the first flight on July 14. “Once we have a couple of months of trying out this specific route, we will evaluate it and see if we can add more flights, keep it longer or add it to the other routes that go up north,” says John Beardy, community relations manager with North Star Air. Although North Star Air initially planned one flight in the morning for the Flex Flight route, the airline has since added an afternoon flight to the route due to the demand. The ATR 42-300 is designed to carry up to 44 passengers, with four seats across the passenger cabin. Beardy says there has been a “very positive” response from the communities about the ATR 42-300 service. Aircraft bookings are available online at northstarair.ca or through reservations at 1-844-633-6294 ext 3. North Star Air was founded in 1997 and now provides passenger, charter and cargo services with a fleet of 12 aircraft through bases in Thunder Bay, Sioux Lookout, Pickle Lake and Red Lake.